It’s beginning to smell a lot like Christmas around here! Many might be bustling around, decorating their homes or making shopping lists, but I’m thinking about the food! I’ve been hosting Christmas Eve dinner for several years and I’m already thinking about menu planning, with the participation of my children, of course. We get all excited and put way too many things on the menu, only to scale it down later when we realize there’s too much food and not enough time to prepare it all. So as I’m thinking about our holiday menu I’ve decided to share with you, over the next few weeks, some of the classic holiday recipes that my family prepares. I’ll be posting a combination of traditional dishes as well as new dishes that have become family favorites (and I won’t forget dessert). 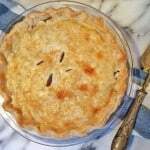 And I’ll start today with a local French Canadian Christmas favorite, tourtière. 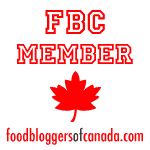 You might be wondering why an Italian origin gal is sharing a tourtière recipe? 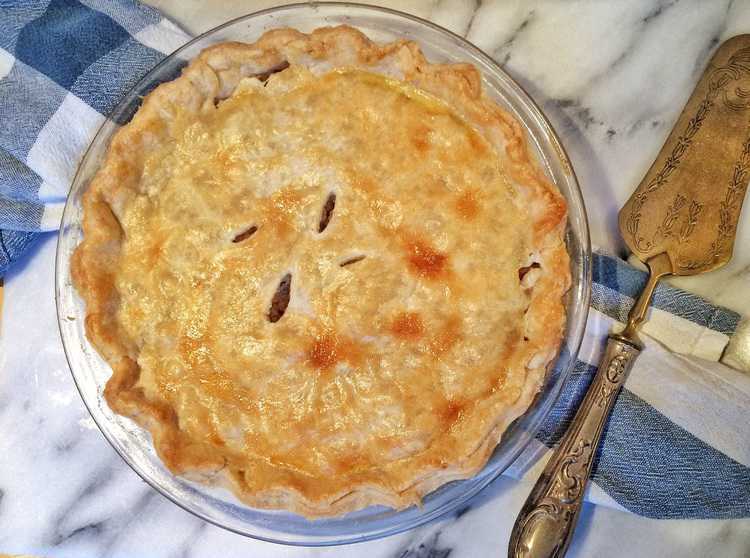 My mother loves tourtière and ever since I got my hands on this wonderful recipe, we’ve held family tourtière baking sessions each year. 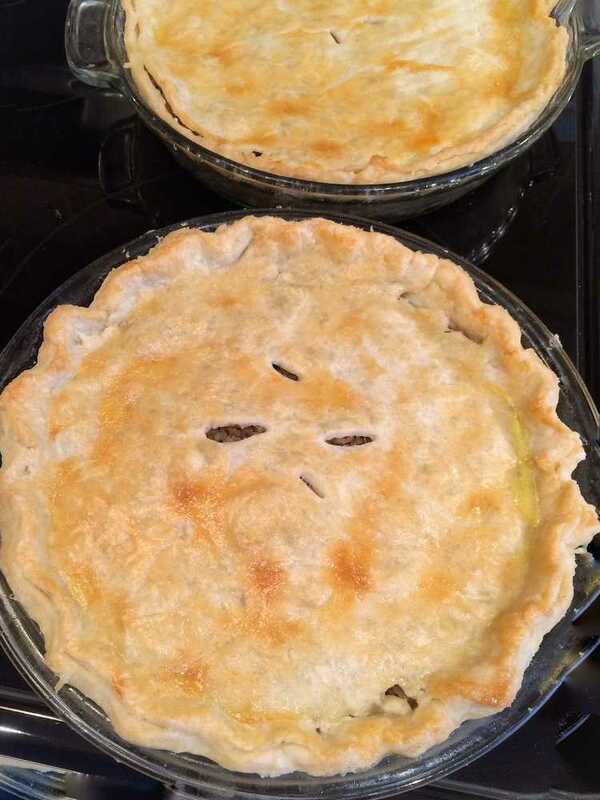 During Christmas break, my children and I head to my mother’s house and we spend the day making tourtière (we usually triple the recipe) that are then frozen or distributed to family members. The day culminates in a tourtière eating festival along with pastina, (’cause we have to Italianize it a little bit) mashed potatoes and a salad. Unlike our French Canadian friends, we don’t serve our tourtière on Christmas Eve. Italians typically serve a fish and seafood only meal on Christmas Eve. I’ll get into that menu in an upcoming post. At some point during the holidays we’ll have this tourtière supper and last year it happened to be on New Year’s Eve. So where did this recipe come from? It was so generously given to me by my dear friend who got it from her partner’s French Canadian family. This recipe was handed down in their family so this is the real deal! 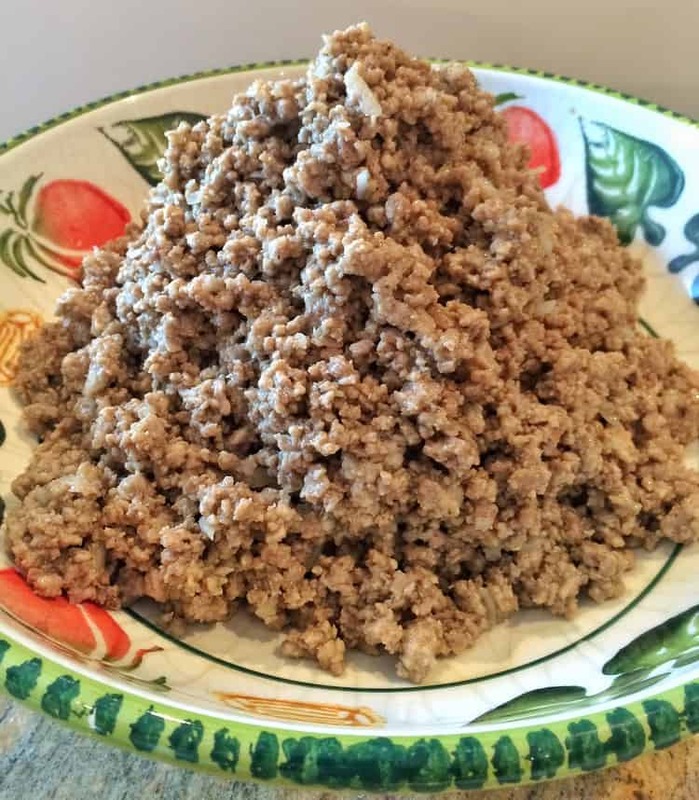 The recipe I’m sharing with you is unaltered except for one detail, my mother did not like the idea of using 100% ground pork so she kind of Italianized it by swapping out half the pork with ground veal. Just a question of taste, really. 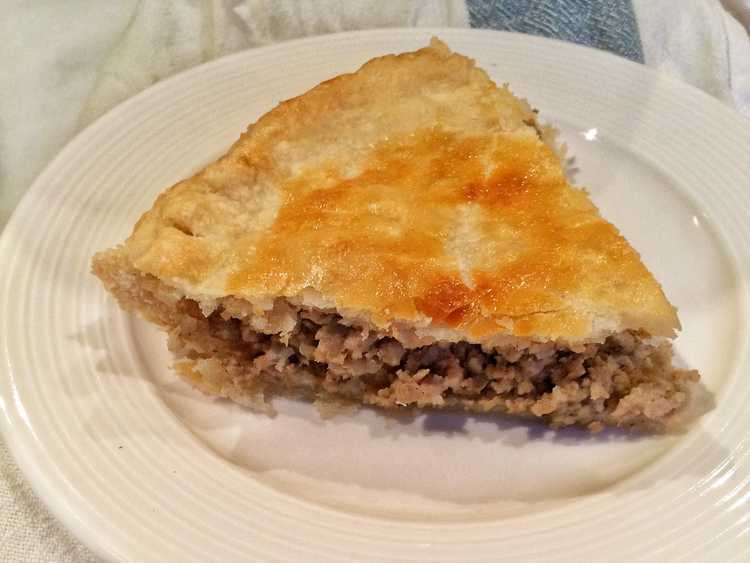 But if you want to make the true authentic tourtière you can stick to all pork. It’s really quite simple to make. 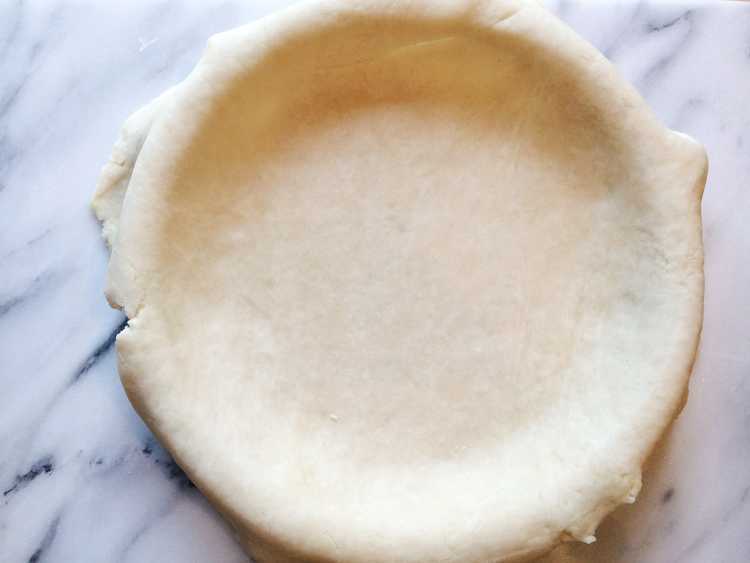 While the meat is cooking, you have plenty of time to prepare your pastry dough and roll out the bottom crust of each tourtière. 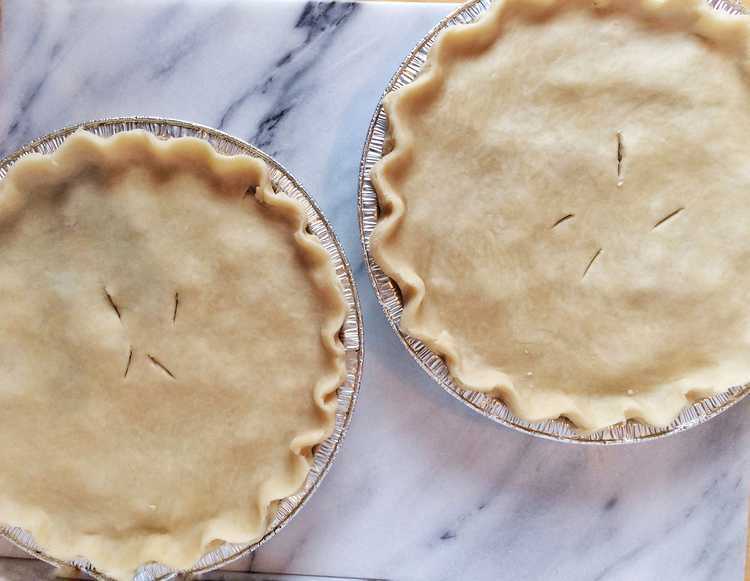 In less than 3 hours (including baking time), you’ll have 4 tourtières ready to enjoy or you can freeze them and have them ready for your guests during the holidays. What preparations have you started for your Christmas feast? Tourtière is a classic French-Canadian meat pie traditionally served on Christmas Eve. To prepare the filling, place the ground meat in a large dutch oven and cook slowly over low heat, stirring often. Stir in the black pepper, celery salt, ground sage, salt and onion. Continue to cook on low heat for 1 1/2 hours. After an hour, add the grated potato. . When the meat is ready, transfer to a wide, shallow bowl and allow to cool slightly. Meanwhile, to prepare the pie crust, place the flour in a large bowl. Add salt and baking powder and stir until combined. Cut the shortening into cubes and using your fingers or a pastry blender, work the shortening into the flour until the mixture resembles course crumbs. In a separate small bowl, beat together the egg, water and vinegar. Add to the flour mixture and press together with your hands until a dough is formed. 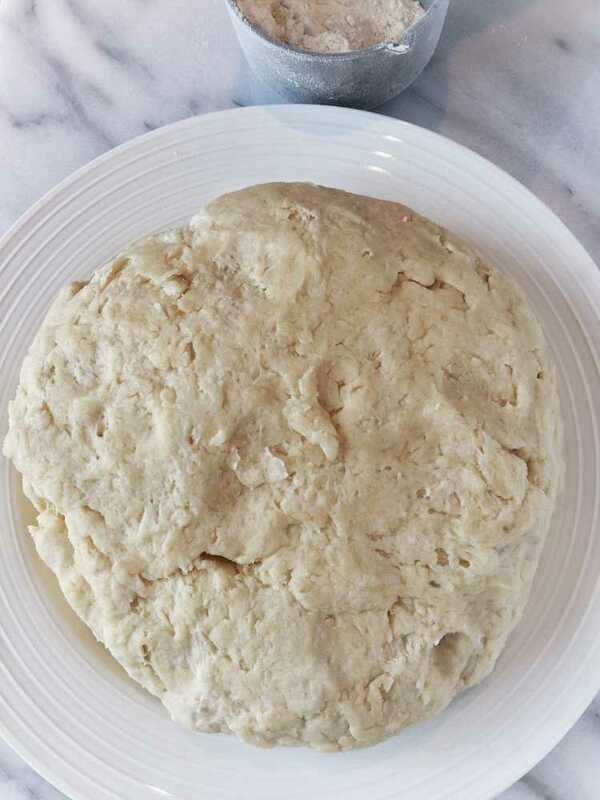 Shape the dough into a disk, cover with plastic wrap and place in the refrigerator for 30 minutes. Preheat oven at 375°F. Remove the dough from the refrigerator and cut into 4 pieces. Flour your work surface as well as a rolling pin and roll the dough into a circle wide enough to cover the bottom and sides of your pie plate. Transfer dough to the pie plate. 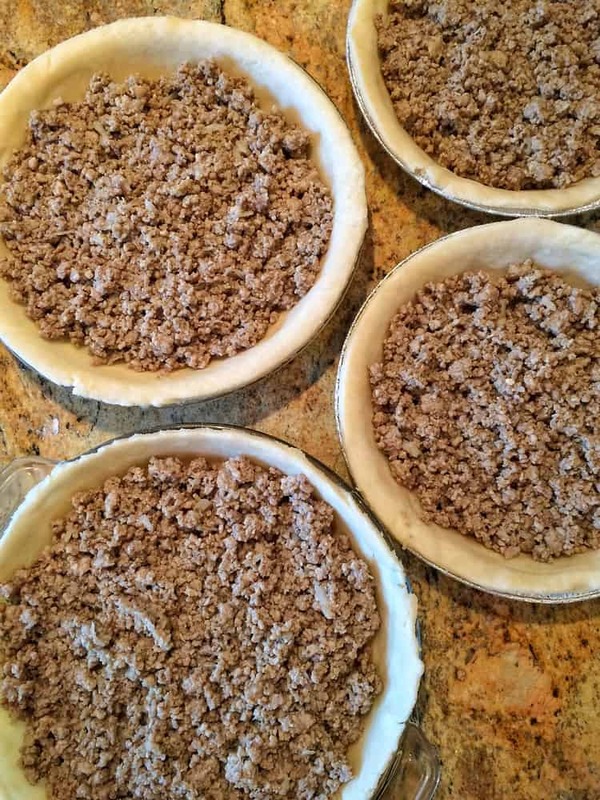 Divide the meat mixture among the 4 pie crusts. 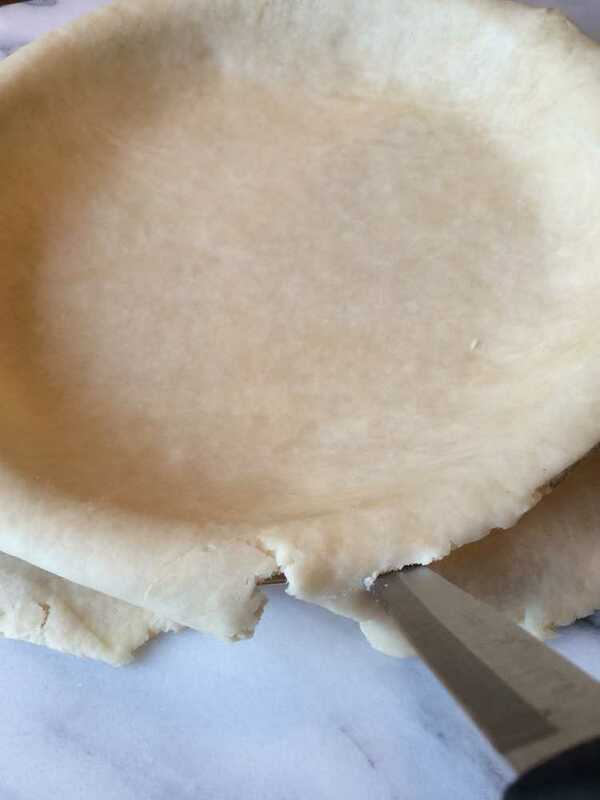 Using a sharp knife, trim the excess dough hanging over the rim of the pie plate. Reserve the excess dough for the top crust. Repeat for the remaining 3 pies. Roll the remaining dough pieces together and divide into 4 pieces. Roll each piece into a circle to cover the meat mixture. Carefully transfer the dough onto the filled pie. Fold the top edges under the bottom crust. Press the edges of the dough together to seal and flute as desired. Cut slits into the top crust to vent steam while baking. 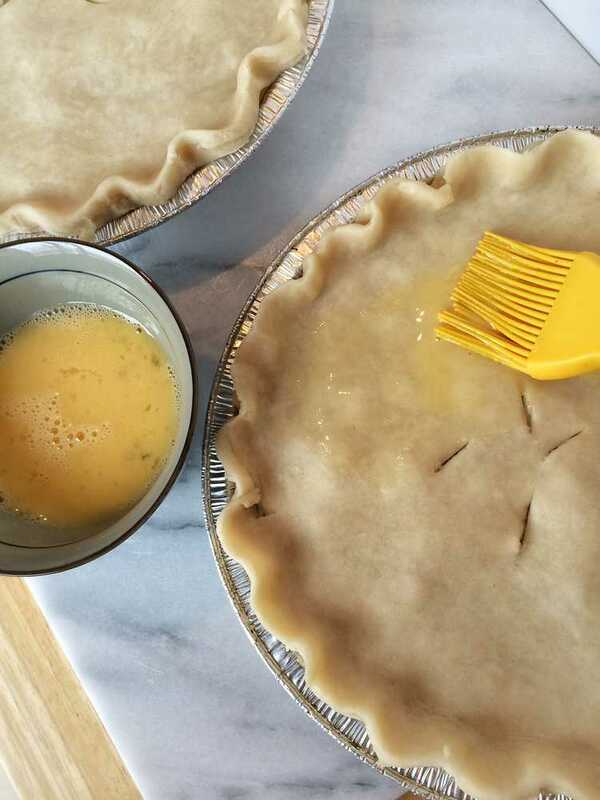 Beat the remaining egg and using a pastry brush, brush each pie crust with the egg. Bake for approximately 45 minutes, until the pie crusts are golden brown. The tourtières may be served immediately, or let cool completely on a baking rack, wrap well in plastic wrap and place in the freezer. « It’s All About The Squash! I’m so glad you enjoyed it Rosa. It’s our yearly New Year’s Day supper! Thanks for your feedback!